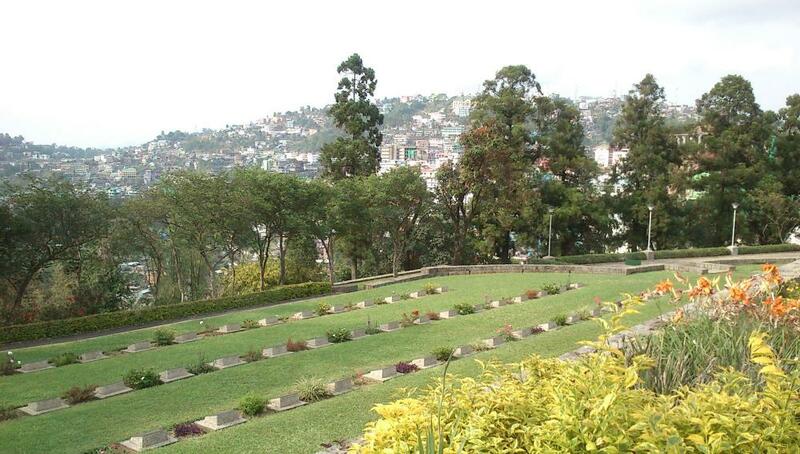 Kohima as seen from the famous War Cemetry dedicated to those who died fighting for Britain during the Second World War at Kohima. “Nagas are very dangerous people,” a serving officer of the Indian Air Force, posted in Assam, father to three children – all in the armed forces – warned me on the train. “People carrying spears and bows-and-arrows are a very common sight in Nagaland. Tum dekhna (You’ll see). The boys are ferocious. They go around in gangs, riding bikes rashly. Beware of them,” he continued. “Oh, and the Naga people love eating dogs. Jorhat ke saare kutte khatam ho gaye hain. Naga log sabhi kutton ko chura kar le jate hain (There are no dogs left in Jorhat. Nagas steal them away),” he added, looking well-pleased with himself. I was travelling to Guwahati for a two-day trip, from where I was to go to Nagaland. By the time I was in my third or fourth hour of a 34-hour long train journey from Delhi to Guwahati, the ice between my co-passengers and I had already been broken, and we had comfortably graduated from divulging the wheres of our travels to the whys of them. This was the first time I was visiting the northeast – a region I had always been very strongly attracted to and one that I had really wanted to explore since having done my Master’s thesis on the different insurgencies in that area. My academic familiarity with the northeast allowed me greater discretion to tell truth from fiction than a complete neophyte could. Yet, I am no authority on the northeast. Moreover, the ground realities can be a very different animal. So, I was prepared for any kind of experience that reinforced the widely-held stereotypes on the northeast or threw pleasant surprises or even shocks at me. I spent a good three days in Nagaland, traversing towns, villages, and dense jungles through four districts. I didn’t see a single spear or bow-and-arrow wielding Naga. Not one person that I saw or met anywhere during the trip came across as dangerous. Rather, every person I met was so warm and hospitable, I felt totally at home. Given my Himachali origins, Nagaland felt like a familiar place; Nagas like my own people. I ate at Naga restaurants and cafes; detected no dog meat on any menu. In fact, since I am a vegetarian of the eggless variety, food had been a big cause for concern. To my delight, I found enough vegetarian options (not Naga food necessarily though) to keep me from obsessing about food. 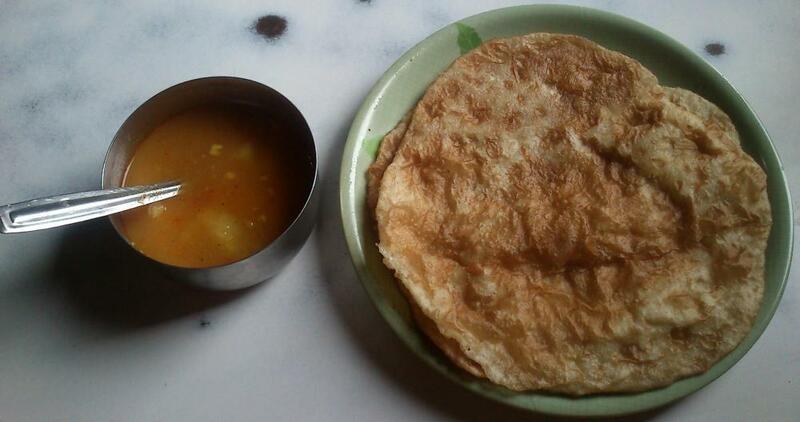 Aaloo-Poori, yes! On the way from Kohima to Mokokchung. Back on the train, when the Air Force gentleman was narrating Nagaland scare-stories, I knew it wasn’t his actual experiences but his prejudices doing the talking. Actually, they were not so much prejudices as exaggerations and untruths, for what he shared with us were not opinions but statements of “fact”. What surprised me about him was that in spite of having spent a considerable length of time in the northeast and despite being a man in uniform, he was no different in his attitude from those in the “mainland” whose biases are easy to pin down to their zero to little exposure to the northeastern states of our country. Granted that he had a jocular nature; he could well have been trying to scandalize me for some harmless fun. But he repeated himself many times over including when my Naga friend, with whom I was undertaking my northeast adventure, joined me at Varanasi, at which point it looked like a case not of humour but one of sheer brazenness. Nagaland’s reputation of being home to the oldest insurgency in the country (a ceasefire is in place since 1997) and the tales of a parallel government calling the shots had shaped my own perceptions of it, and I had always thought of it as a state that bore visible signs of a strained relationship. What I witnessed, however, was a peaceful place with no palpable law and order problem. A place where everyday life could be seen going on normally – kids leaving home for school, men and women driving to work, shoppers buying groceries, taxis and buses transporting people around. That is not to claim that there is complete normalcy. As soon as the clock strikes 4.30 in the evening, shops begin to close. Parallel governments indeed exist – not two, not three, but as many as seven to eight – which are essentially extortion rackets capitalizing on a favourable environment created by a politically-weak, corruption-infested government. What about the army? Is there any military presence? It so happened that the day I boarded the train for Guwahati, 18 armymen were killed in Chandel district of Manipur in what was described as one of the worst attacks on the army in nearly two decades. And the responsibility for the attack was claimed not by a Manipuri insurgent group but a Naga one. This inevitably led to much movement of the army in Nagaland. While most of it happened in the eastern parts of the state bordering Myanmar, there was noticeable troop movement even in Kohima and all along the way to Mokokchung. At the height of insurgency, this was a norm, but I was told that army is now mostly confined to the barracks. Army truck carrying jawans. Behind: Civilian truck with the Tricolour painted on it. It isn’t as if everybody in the streets of Nagaland is gung-ho about being Indian. I did see several Nagaland registration number bearing trucks painted with the Tricolour and carrying the slogan “Mera Bharat Mahan.” But I suspect they were mostly owned by the Marwaris, who are the most prominent business-owners in most parts of the northeast. There is, however, a very discernible desire to shed the baggage of the past and look forward to a common future. The real question is if we in the mainland are willing to take matching steps and get over our ignorance towards and contempt for the people of the northeast. After all, it takes two to tango. 1. Naga cuisine is principally Pork-based. Fish is also very popular. Some sections of the society have taken a liking for dog-meat, but the fabled Naga love for it is a myth that has taken a firm root in the minds of the mainlanders. Not just Nagas, all northeasterners are accused of being very fond of killing their dogs and eating them. 2. Cows are the rarest of rare animals in Nagaland. Hardly surprising then that beef is not too common. Milk, ghee, yoghurt, and butter are alien concepts. Chai is quite popular and is made using milk powder. 3. Nagas make no use of oil in cooking. Animal fat is their source of fat. Boiling, steaming, smoking, drying, and fermenting are the usual methods of cooking. Vegetable stews are an essential part of diet, and no meal is complete without at least one stew. 4. Traditionally, Naga food had no place for sweets and desserts. Lately, however, cakes, pies, and puddings have made their way to the Naga platter. 5. Finally, to my great amusement and astonishment, paan has become a hit with the Naga populace so much so that paan shops can be spotted in every nook and cranny. 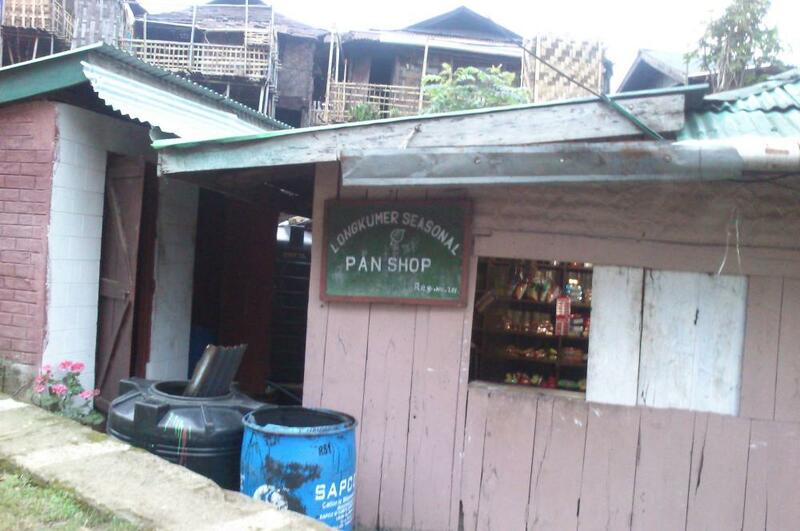 One of the many Paan shops I spotted throughout Nagaland.